Don't you love it when you pick up a book that immediately explains experiences you've had but had no explanation for when they occurred? This doesn't happen often, but it might with Astral Dynamics, Robert Bruce's straightforward how-to manual on astral projection. Perhaps you've had a spontaneous out-of-body experiences and didn't know it! 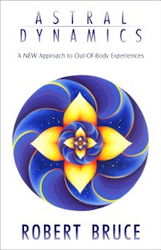 This extensive tome teaches you everything you need to know to accomplish successful, planned out-of-body travel; how to exit the body, how to get around on the astral plane, and how to get back in with solid, provable memories of the event. Bruce writes very clearly and uses down-to-earth terminology so that you learn not only how to create a "real-time double" to astrally project but also about the physics of the nonphysical world. Out-of-body experiences can be so confusing that enjoying them or employing them usefully can be a serious challenge. Fortunately, Bruce now brings his 25 years of interdimensional experience to the aid of astral explorers the world over, and everywhere else too.